Since the event the amount of emails and energy I have received from people has been huge. In the works is setting up an event in the next month or so to keep up the momentum! Thank you all for coming out! Special thanks to presenters and Justin Zoras for filming and editing the final product. Video is in 4 parts below! After a brief outline of theory surrounding promotion of student -led, primary research-informed, actions on STSE issues, practical classroom-tested examples will be shared. With issues, debates among powerful decision-makers are emphasized; with research, correlational studies are emphasized; with actions, IT- based ones are highlighted. Too Many Slipping Through the Cracks…Can We Save These Young Males? Today has been a super tough day. I was using the mobile computers in the classroom and we were waiting for everyone to get logged into the site and one student had a music video on. It turned out to be a former student rapping and I told him I knew him. The student let me know that he was just arrested. I went online to Google it and sure enough he is up on almost 10 major charges and is now 18 years old so his name was published. My heart felt like it stopped and just an overwhelming feeling of why him? What he did wasn’t right, but I feel behind all that he is a good kid. We can’t choose the cards we are dealt when we are born and I can’t imagine how I would turn out to be dealt his hand. I taught him in 3 classes and to see him progress with school, smile and just be a regular teen was amazing. This is why I love inner city schools. I see him in the music video angry, violent and letting everyone know he isn’t afraid to shoot anyone. I just wish I could have done more when I taught him, engaged him more, helped him get a job so he didn’t have to hustle. Realistically I know I have helped so many students and I can’t take the blame onto myself. Last month seeing another student on the news losing his brother, having another stabbed just over a year ago in the school and then recently another one stabbed. These are KIDS who have been forced to grow up too quickly, learn hard lessons from the street and in many cases pushed out of success. I am thankful for caring teachers, community organizations like boys and girls club and pathways that pour endless time and emotion into helping these boys. We need places for them to be safe, learn skills, get them jobs, speak with caring adults/mentors and don’t give up on them! I am still buzzing from the energy, enthusiasm and experience that filled the room last Thursday at OISE. 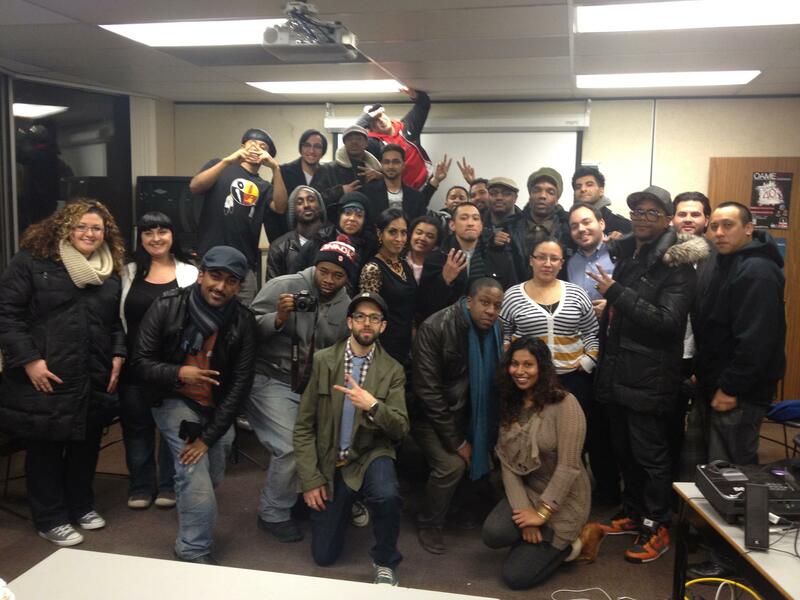 The wealth of participants made the event and Sam, J-Rebel, Sun and Malikah really inspired the room. From what started as a conversation on twitter under the #HipHopEd hash tag (Tuesday at 9 PM) between Sam Seidel @husslington and myself @brandonzoras weaved into a great event. The room was filled with community, teachers, educators, artists, professors, researchers, and hip hop enthusiasts. Malikah from Red Slam Collective opened the event by smudging and presenting a drumming act along with vocals. Through the introduction of the people in the room, we all soon found out Toronto has a massive Hip Hop scene with caring people who want to see youth do well. I opened with a short bio and presented some of the classroom strategies I used in my classroom and projects that involved Hip Hop. Sam Seidel inspired the room with many messages that resonated with the group. He discussed working together and “sharpening swords” with each other to not just celebrate the successes we have with Hip Hop Ed but to critically analyze and give feedback. He encouraged the Toronto group to “Think Bigger, Keep It Real and listen to students” to grow. He showed us his video on Remixing High School Education, and also what happens at The High School for Recording Arts. J-Rebel and Sun shared their program “Don’t Believe the Hype” and experiences working within the community and schools. They emphasized having community groups working in our schools is such an important task. What happened next was a conversation that made the room explode! Participants from every possible background started discussing how to educate (both in and out of traditional schools) using hip hop. Much of the conversation revolved around the tough time the community has navigating large institutions like schools boards and higher education. Funding was a top problem amongst community groups trying to get their program off the ground and into schools. Many teachers shared their positive experiences with integrating hip hop and community into their classes but were asking for more. Professors wanted to know who should teach hip hop education, what is the qualifiers for this. Community members and artists wanted people to understand that often they felt schools welcome them in for a workshop or demo but often it is a one shot event that doesn’t offer support for the community. The conversation was far from over. Lastly networking happened where people got to meet face to face with each other to discuss their own programs, best practices, future ideas and also give congratulations. I am going to be as bold to say this is the start of something huge, not Hip Hop Education, as that has been happening already but I am talking about this network of caring hip hop enthusiasts. They all care about their communities, roots and the futures of the youth. With this being said, we will be starting a blog http://hiphopedto.wordpress.com as a resource, collaborative and collective area where events will be posted and ideas shared. Please email me any resources or if you would like to a collaborator on a regular basis. In discussion as we speak, is to set up meetings on a regular basis and hear from the community. 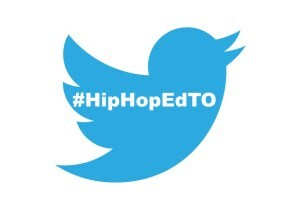 We would like to keep the #HipHopEdTO hash tag alive where we can post about Hip Hop Education in Toronto. I would like to sincerely thank all those that attended and presented. I was moved beyond words by the turn out and true wealth and knowledge that was brought. The YouTube recording will be available shortly for those interested! Let’s keep this alive. Let’s Talk Hip Hop!